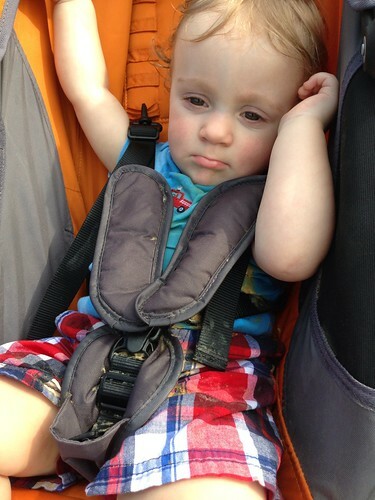 As the weekend wore on Martin continued to be grumpy and feverish. His normally sweaty head (received from a bizarre recessive gene in his mother's family) was even more sweaty from fever and the fiery grump that boiled in his belly. We got very little sleep Friday night and woke up Saturday morning in a pickle. The apartment was a complete disaster. Our apartment is normally a disaster but the lack of sleep and the sick Martin had thrown it into a state so bad that it made our skin crawl to spend any time at all there. 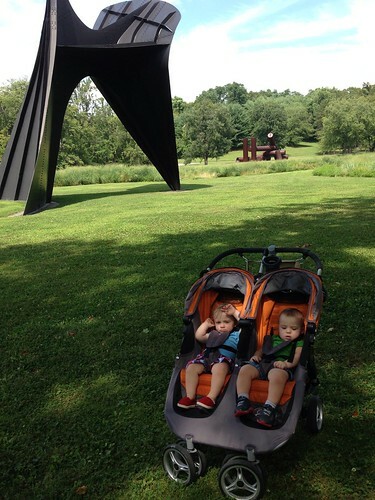 Knowing we had a lot of work to do to get our living quarters in order we did what any sensible parents would do . . .
. . . we took the Wombats to Storm King Art Center! We knew this was a terrible idea but it was great getting out of our disgusting house. 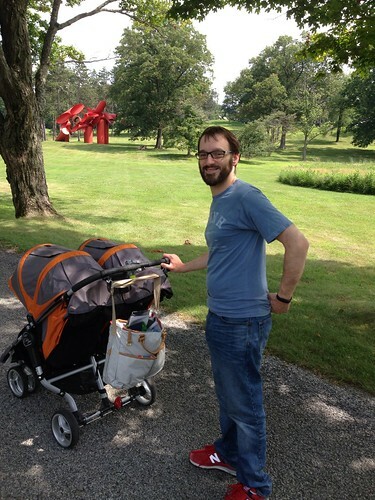 It was even great while I was pushing nearly 100 pounds of Bubs, stroller, and accessories uphill. 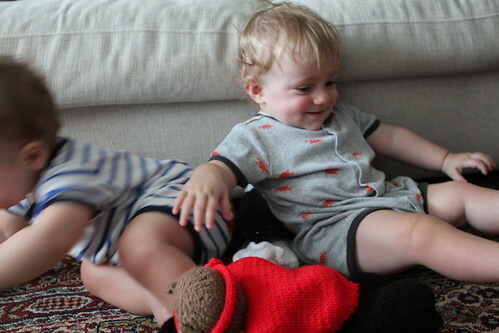 Elliott took pity on poor Martin and tried to cheer him up by smacking him on the head with all of his might. It just so happens that this is exactly what Elliott does when Martin is feeling fine as well. Overall it went well until the end of the tram ride where Martin erupted into a volcano of vomit. He spent the rest of the tram ride sitting in a pool of his own sick. Martin felt fantastic after the incident. After I recovered emotionally we stripped him down, cleaned him off, and packed everyone up for the journey back home. Once home we immediately broke out the drinks. 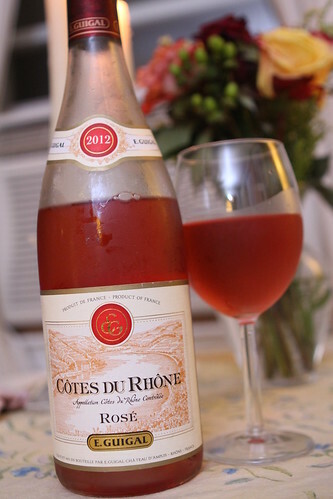 Jen had this Cotes du Rhone Rose and I had a Slumbrew Lobstah Killah, another souvenir from our recent Rhode Island trip. We ordered Italian from the restaurant down the street and ate it irresponsibly in the filth of our own living room. Why is it that being irresponsible feel so wrong and so right at the same time? 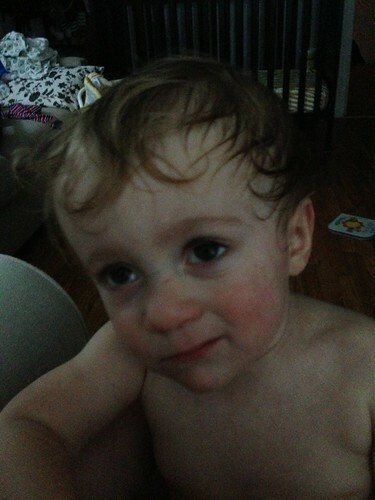 The next morning Elliott awoke with the barking croup cough just as I was on my way out to work. 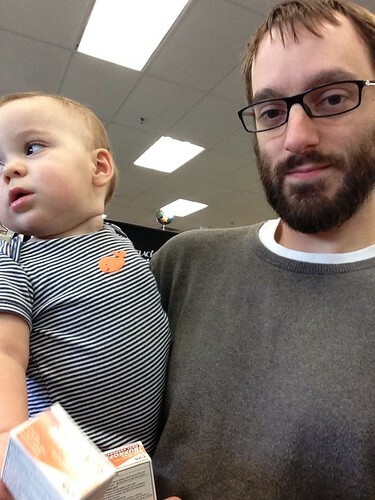 Jen didn't hear it so I woke her up, lovingly told her that Elliott now had croup, and ran out the door to work. It's what any responsible father would do. Jen was kind enough to allow Elliott to watch Brisco County, Jr. all morning while he wasn't feeling well. I say this as if this wasn't a huge treat for Jen as well. 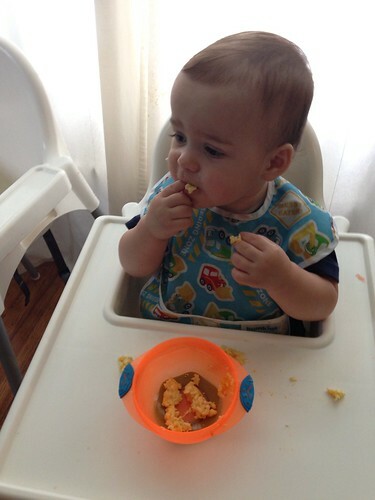 Jen fed Elliott scrambled eggs while Martin slept in extremely late. Finally Martin woke up, not necessarily of his own free will, and Jen put him in front of a brunch that he stared past, dazed. 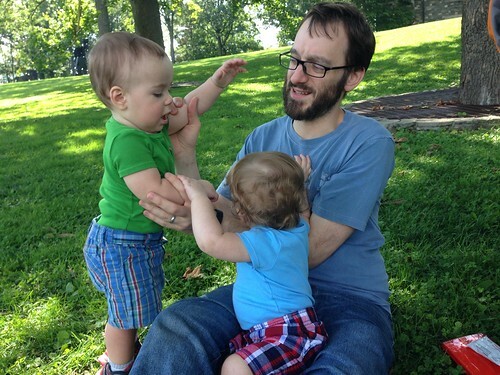 A little later Elliott comforted Martin by smacking him in the head with all of his might. 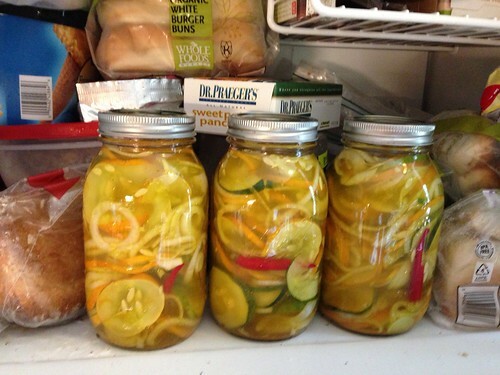 Jen somehow found time to make her famous freezer pickles, my favorite pickles in the whole world. The last time Jen made these she did it in the course of about an hour. This most recent batch took approximately five days from start to finish being put together during the tiny slivers of time afforded to us by the Wombats. For dinner I cooked up a nice pork chop which I roasted in the pan. I made smothered cabbage (from the farm) with Andouille sausage, bacon, onion, garlic, olive oil, cider vinegar, salt, and pepper. 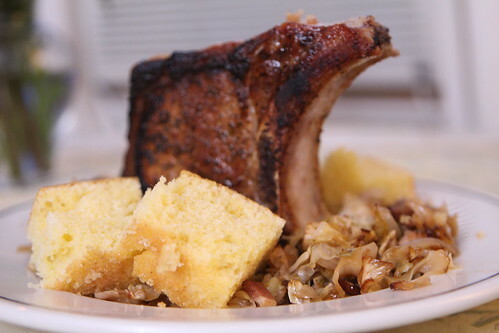 I served the pork chop standing up because I like the height that it gives the plate. 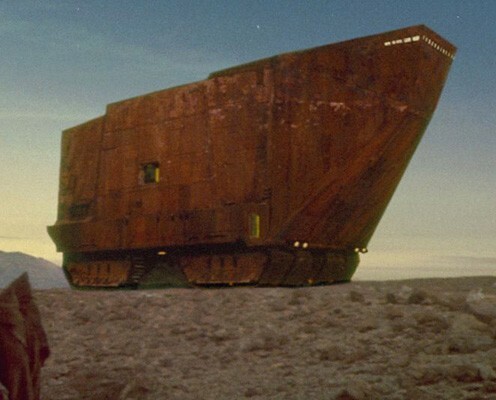 And it also makes it look exactly like a Jawa sandcrawler. 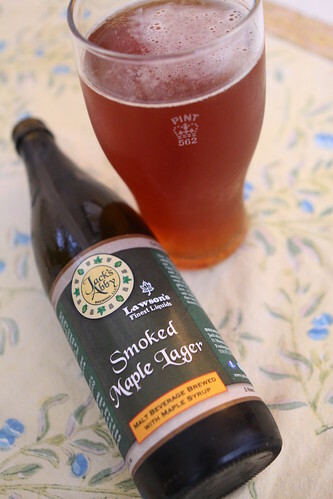 To accompany this beautiful chop I poured myself a Smoked Maple Lager from Jack's Abby, another Rhode Island trip beer. Of course, like almost all the beers I got in Rhode Island, it's from Massachusetts because Rhode Island has an embarrassingly small number of breweries. 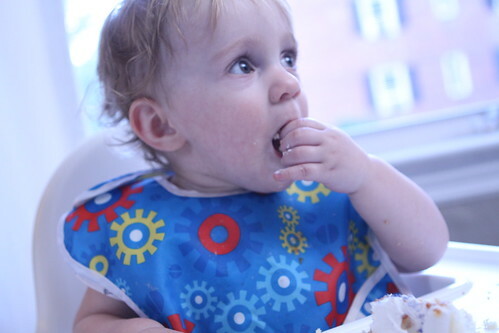 Monday I had to take the day off of work and care for both sick babies: Martin who was getting much better and Elliott who was still fighting off the worst of his croup. Since they were both at peak fussiness and irritability I spent the entire day keeping them out of the house. We went to the park to play and watch two older kids kick around a soccer ball. Whenever their parents clapped the Wombats looked over and started clapping with them. Martin, for some reason, seemed to be nervous about touching the grass. 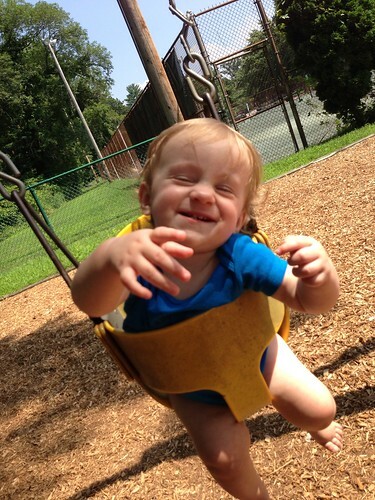 We went to another, more different park and enjoyed the swings. And we went to the most differentest synagogue to pick up our weekly farm share. 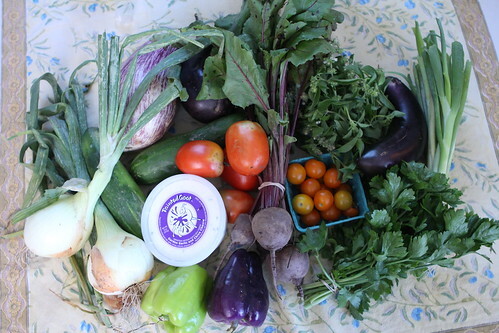 This week we got Red Ace beets, onions, heirloom cucumbers, eggplant, peppers, scallions, tomatoes, basil, parsley, and garlic and chive chevre. 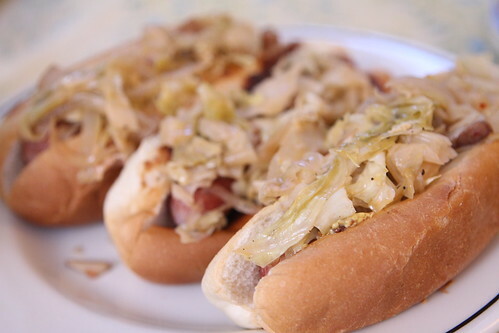 The best I could manage for dinner was to cook up some hot dogs and top them with the remaining smothered cabbage and whole grain mustard. It was pretty tasty but our fridge is beginning to back up a smidge from the collection of vegetables accumulating there. 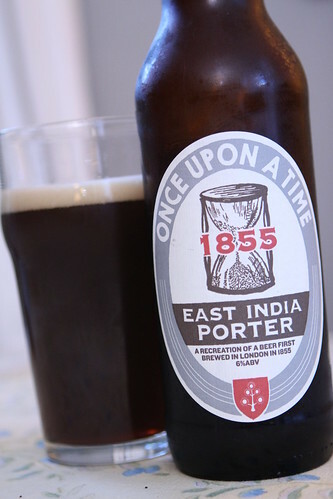 To accompany this fine meal I had a Pretty Things Once Upon a Time East India Porter, another faithful recreation of a historical beer from 1855. Tuesday morning Jen took off for Salt Lake City leaving me with the two mostly-recovered babies who I brought to day care before going to work. I had to leave work around 3:30 PM to pick them up when they told me Martin had a fever again. 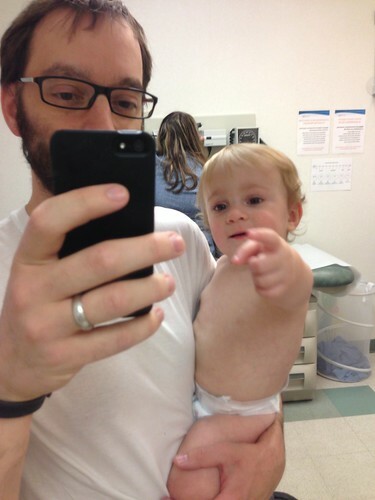 He was over the croup so either they measured his temperature wrong or he was teething. At any rate I had to pick them both up and would have to return with a note clearing him to return to day care. This was, of course, after his fever had been gone for twenty-four hours meaning that I would need to take the following day off of work as well. It sure is going to get difficult supporting these babies on no income. After the most successful dinner in a week and a bath the Wombats played their new favorite game, Door! Door! 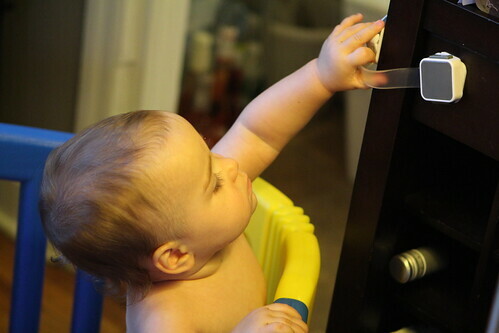 is a game whereby you must touch the door fro your crib and move it along. 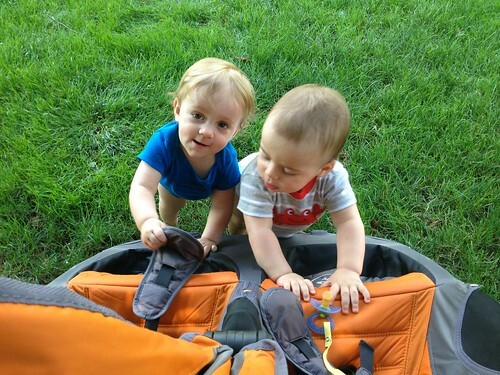 The objective is to move the door, squeal, and inflict as much physical harm on your brother as possible for no reason other than your own unbridled zeal. 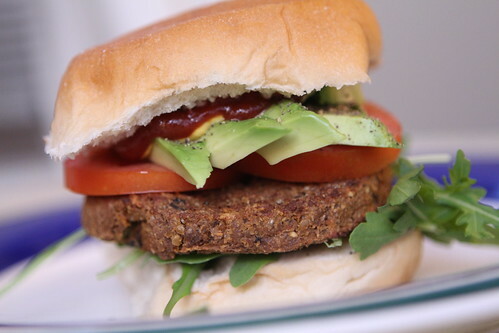 After I finally got them to bed I treated myself to this veggie burger for dinner. When Jen is on a work trip I have a pretty strict policy of not buying any groceries and simply working my way through our vast reserves. This worked out pretty well as I happened to have a veggie burger and bun in the freezer as well as some assorted accompaniments. Jen surprised me by leaving some nice beers in one of the drawers with the Wombats' clothes. 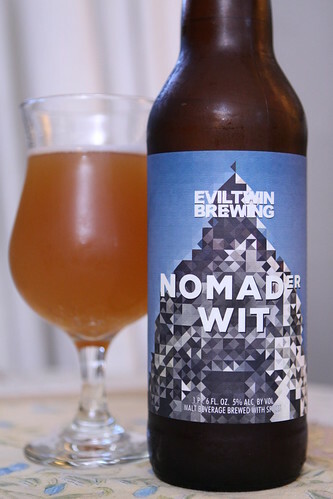 I didn't think I'd have time to chill this in time to drink it last night but thanks to the guys being particularly stubborn about going to bed I had plenty of time to get this Nomader Wit from Evil Twin Brewing nice and cold to enjoy with dinner. Luckily Jen had told me to check the drawer and then reminded me otherwise I would have never found them. My exploration into the drawers of the Wombats' dresser is at a fairly remedial level. 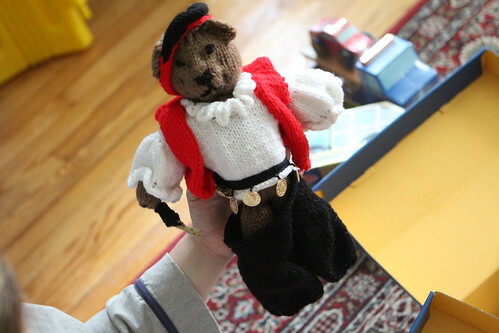 I am not the Lewis and Clark of the Wombats' wardrobe. Today I stayed home with Martin again even though he was perfectly fine. The doctor was extremely annoyed when I brought him in to tell me what I already knew: that he was completely fine. 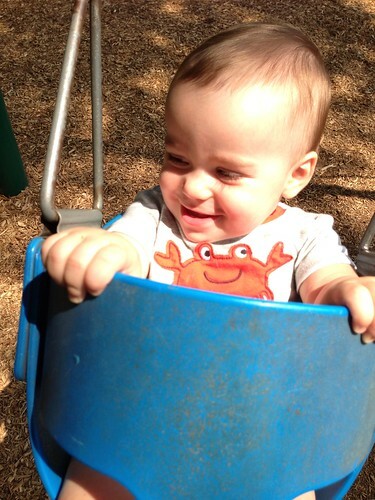 I got the note I needed to return him to day care tomorrow and we were on our merry way. Martin spent a lot of our time at home today playing the phone game. 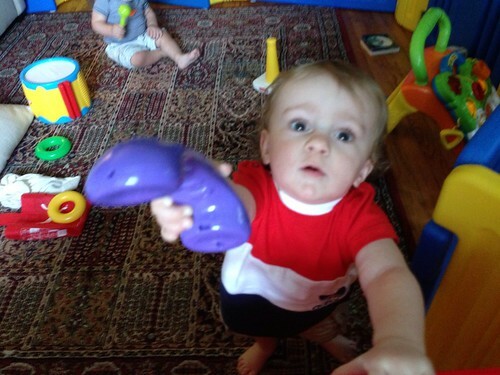 This is an odd game where he takes a plastic, purple phone and hands it to me. No matter what I do with the phone he just looks at me with a completely serious, unamused face until I give him the phone back. 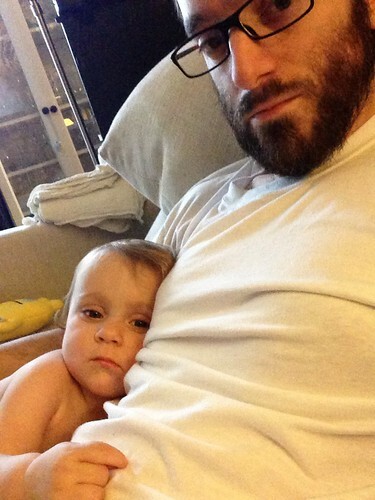 Then he sighs with disappointment and says, "Dada!" and hands me the phone again. He will do this for hours even though he seems to derive no joy from it whatsoever. Tonight, while Martin settled down watching Brisco County, Jr. 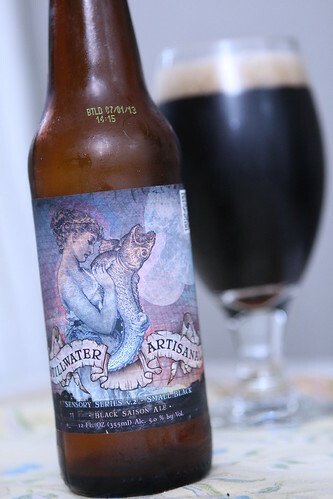 I had this beer while standing in the kitchen and eating a sandwich. 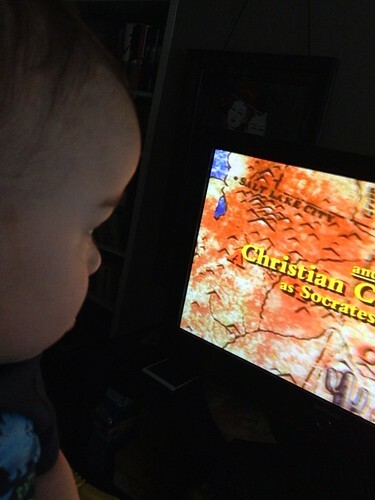 After not hearing Martin fuss for a while I returned to find him asleep in front of his favorite television program. 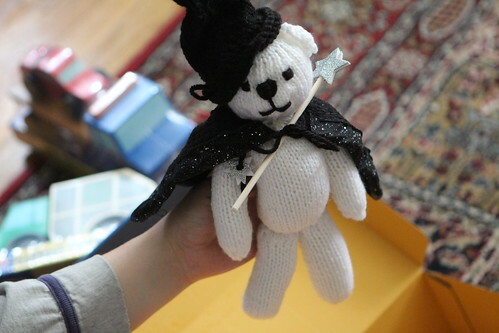 I picked him up, carried him to his crib, then took a deep breath of relief. Only two more days until the cavalry arrives in the form of Jen. 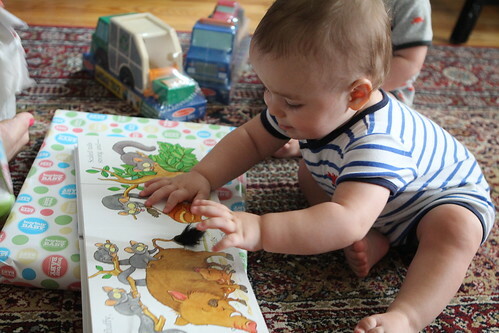 Watching two one-year-olds is laughably easy when you receive any form of help. Maybe I'll even get a chance to use the bathroom when Jen gets home! Last Sunday the Tour de France came to a dramatic night time close in Paris where they awarded the yellow jersey to yet another Englishman while projecting odd lights on the Arc de Triomphe to make it look like it was dancing and changing shapes like a Transformer. I wonder how Napoleon would feel about this turn of events. It took us about three days to complete watching the stage in hour long increments thanks to the two wild animals that now live in our apartment with us. Said wild animals have developed a new game after their shower. 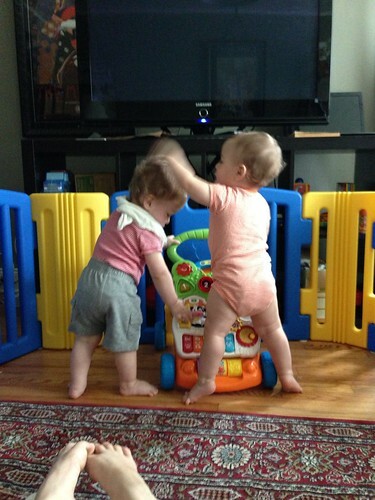 While one of them gets a fresh diaper and put into their pajamas the other crouches in the crib (which we use as a sort of holding pen) and then jumps up to surprise the other. It's enjoyable to watch and makes the baby on the changing table only writhe about 85% as much as normal which makes diaper changes a breeze! This week Jen picked up the share. 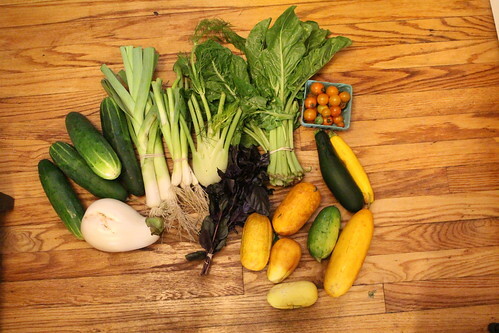 We received copious amounts of cucumbers, eggplant, spinach, leeks, smaller leeks, fennel, Thai basil, and Sun Gold tomatoes. 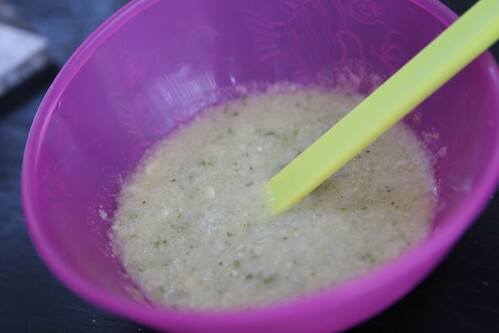 Jen made a cucumber soup while I was at work. I did not partake of any due to my extreme hatred of cucumbers. I did, however, put it into a bowl to feed the Wombats. Their new thing is that they are extremely picky eaters. This means that neither of them will eat what the other is eating or what we eat for dinner. This means we have to make three separate dinners so that everyone can go to bed with a full stomach. On Wendesday I got a call that Elliott was not feeling well. He had been sick to his stomach and developed a diaper rash so severe that it caused him to spend all of his waking time screaming. I went to pick him up and took him to the drug store where he would not be calm unless I allowed him to hold some of the merchandise, in this case a container of children's ibuprofen. I was pretty sure they thought I was stealing this at the self check-out but they took pitty on me and didn't confront me about it. This could have been simply because they took pity on me but it was more likely because they hated their jobs. 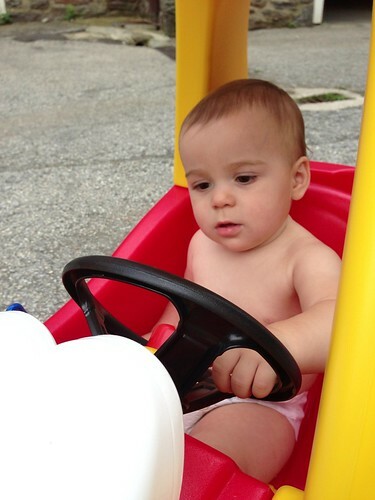 When we got home I let Elliott swing for a bit then he took a spin around the driveway in his Cozy Coupe. When inside he took part in his new favorite game where he crawls under the television and turns off the surge protector. This is not my new favorite game. For the last week or two Elliott has been crawling at such a speed that he lowers his head, seemingly to cut down on wind resistance and get better speed. We call this is time trial crawl. After several failed attempts I was finally able to capture this on video. It's not the best example I've seen but it's the only one I have. Elliott was wiped out so I bathed him and got him ready for bed. 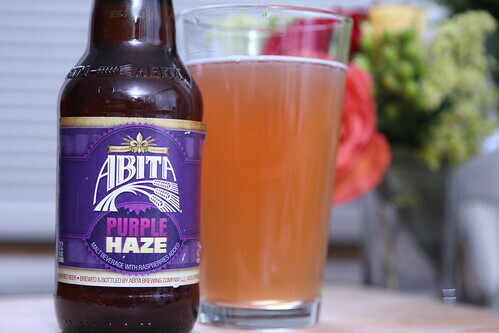 While I waited for Jen to return home with Martin I had a Purple Haze from Abita, a beer I haven't had in at least ten years. 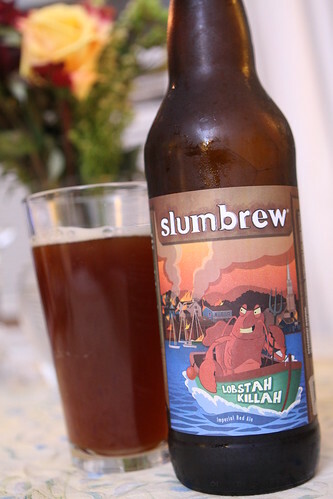 It was too low in alcohol to really satisfy after the day I'd had but it was a nice start. 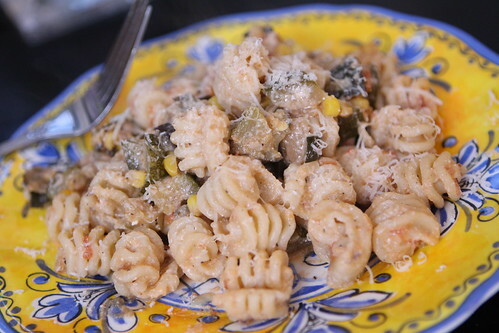 For dinner I used the leftover ratatouille from the other night, added some grilled corn from our barbecue, ricotta cheese, and tossed in some ratiatore with some Parmigiano-Reggiano. 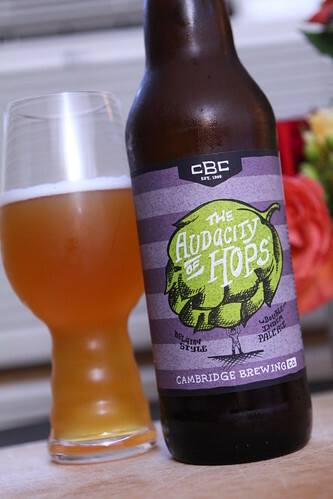 To bring up the ABV average for the evening Jen and I shared this The Audacity of Hops from Cambridge Brewing Company. Shortly before bed Martin began screaming and I went in to comfort him and get him back to sleep. In the night it happened again and I found him curled up, crying, and hot to the touch. When I took his temperature it was 104. 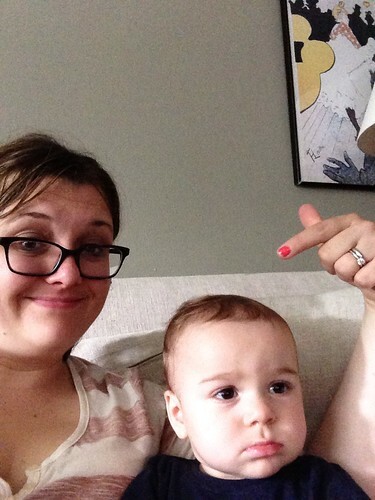 We called the on call doctor at 4:00 AM and she confirmed what Jen already suspected: croup. Apparently it's not just something that affects characters in Anne of Green Gables. It is all too real. After a lot of ibuprofen, and very little sleep, we woke up in the morning and took the guys to their well-timed one year checkup. 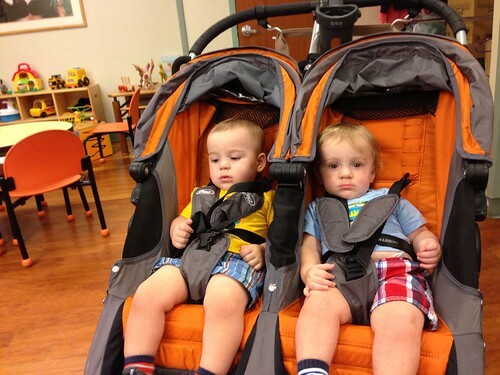 There we performed the well-choreographed dance of twins at the doctors by entertaining one baby at a time. Then allowing the other to get checked out, and possibly remove all the doctor's equipment from its location bolted to the wall. After the appointment I brought Elliott to day care and kept Martin at home to watch after him. This included a couple of walks to the local dealership so I could get my car inspected. 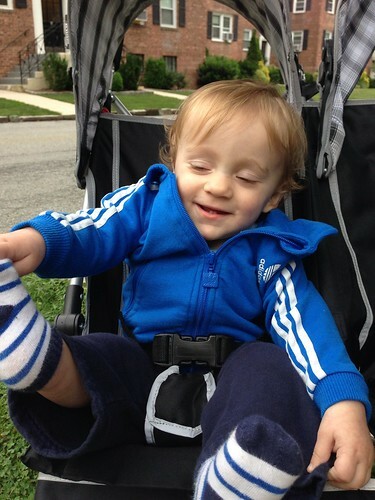 It was a shockingly cold day for July so I had to dress him in a jacket and long pants to keep warm on the walk. The socks kept him thoroughly entertained as he spent much of the walk trying to remove them. The socks didn't keep him entertained all day. Back at home he was very warm and just wanted to lie there. Normally if you put him down on the couch he spends all of his energy trying to hurl himself over the edge. Elliott, how had been picked up from day care at this point, had enough energy for the two of them. He spent much of the time standing up on the couch and leaning over and see what I was doing on my phone. Eventually he would lean too far, fall over, and do it all again. 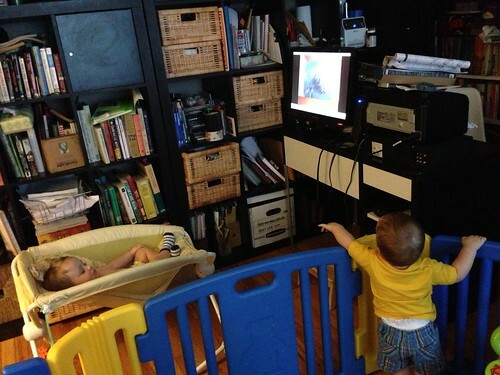 I set up Martin in his Rock N' Play and played the movie Animalympics on my computer to keep him entertained while I played with Elliott in the gated off area. Eventually Martin fell asleep after a long day of napping. Elliott followed soon after. 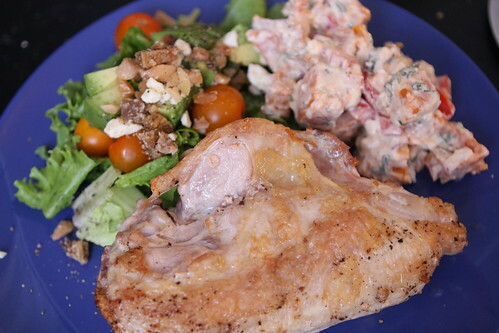 For dinner I threw some chicken breast in the oven and made a salad with lettuce from the far, Marcona almond, feta, fig, avocado, and tomato from the farm. I also made a sweet potato salad with red pepper, red onion, and the remaining sauce for the Mexican corn I made for the birthday barbecue. The sauce was mayonnaise, sour cream, adobo, paprika, chili powder, feta cheese, hot sauce, lime juice, and cilantro. 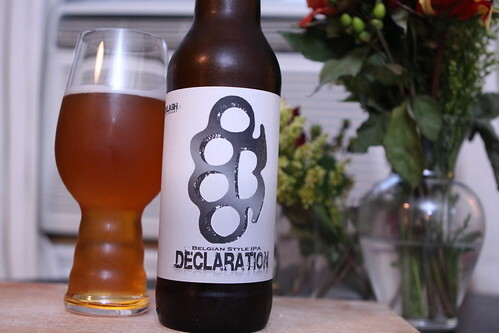 After dinner I sat back with this Declaration Belgian Style IPA from Backlash Brewing Company. Jen had only one beer displaying her to be a stronger parent than I. There's no telling what this weekend will hold. We are at full alert preparing for the inevitable (though hopefully evitable) moment where Elliott catches his brother's croup. 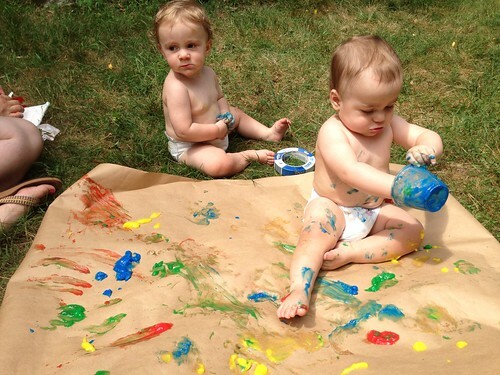 A wise father of twins once told me that they take turns with illnesses. One of them gets the flu, then the other one gets the flu. One of them is teething, then the other teeths. It's almost as if twins have evolved that way. Two babies with one illness at the same time may be too demanding for the parents to take care of and would lead to twins not surviving. If they take turns it is more manageable. I'm not truly convinced this is actually better. 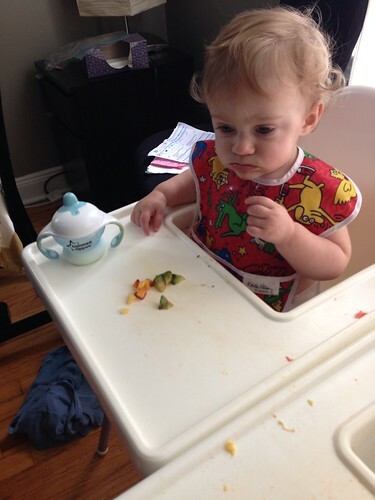 Labels: babies, beer, How'd we use it?, Leftovers, Under the weather, What'd we get? This Saturday we had planned one last birthday party for the Wombats. Sadly, in their life of little privilege, they have only been able to have four birthday celebrations so far this year. It's lucky that they don't really understand what is going on or else we may be forced to follow this precedent in years to follow. Leading up to the party we continued to work on our ongoing baby-proofing. We are really just doing this as it comes up. We're just sort of going along on a daily basis and saying, "Oh crap, I guess they can reach that now." Then we move it or strap it down as needed. Then they almost instantly begin to figure out how to get around it. 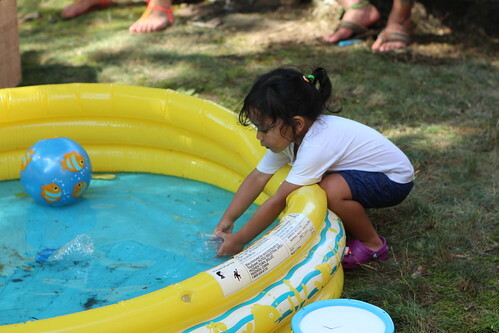 We had a kiddie pool at the party and the walking children very quickly came up with the best game. 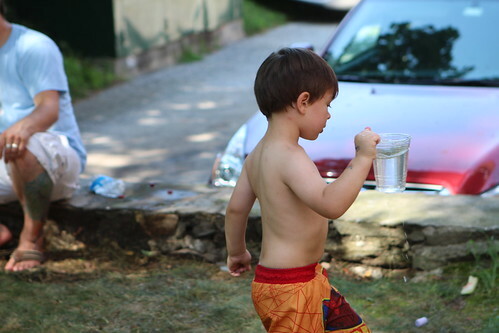 This involved taking cups, filling them with water from the pool, and then throwing the water on our car. This was actually pretty great. 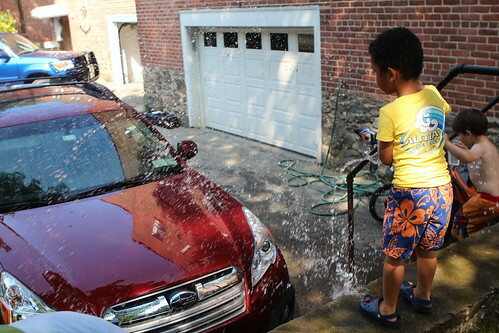 It tired out the kids, kept them occupied, cleaned our car, and all but emptied the kiddie pool. We're thinking of inviting them over every week to see what other time-saving games they can come up with for us. We're thinking that washing the dishes and doing the laundry will be big hits. 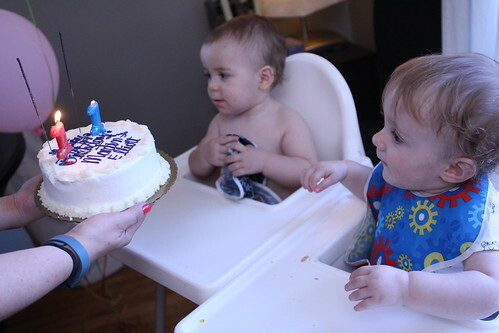 After a long day in the sun the guys got to have their fourth birthday cake/cupcake celebration. 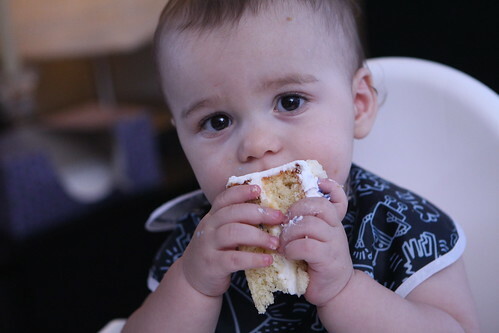 We will probably need to significantly reduce their cake intake going forward. After a dinner of barbecue leftovers we sat on the floor and had a drink. 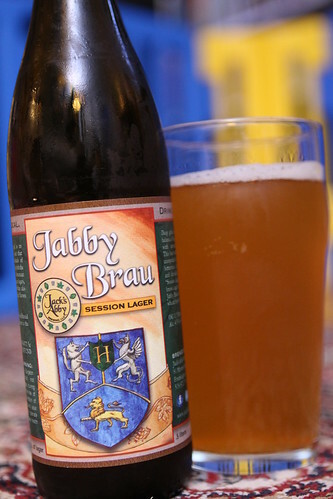 Jen had some rose and I had this Jabby Brau Session Lager from Jack's Abby Brewing, a pick from our recent trip to Rhode Island. I can't really recall a time we've been this tired after a day at home with the Wombats. It was a lot of fun but I'm pretty glad birthdays only come, on average, once a year. The next morning, after their nap, we tried to get them to open some of their gifts but it was difficult to get them focused. 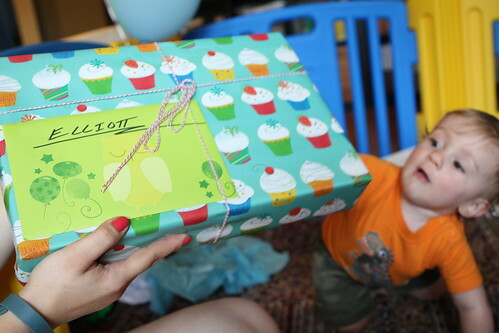 Martin was a bit more interested in Elliott's gifts. Elliott was more interested in ripping and tearing tissue paper than most else. They got lots of great toys, books, and clothing that they were very excited to throw all around the living room to be lost amongst the torn gift wrap and tissue paper. Auntie Caolan and Uncle Paul also got them these fetching dolls based on their D&D character classes: rogue and specialist wizard. 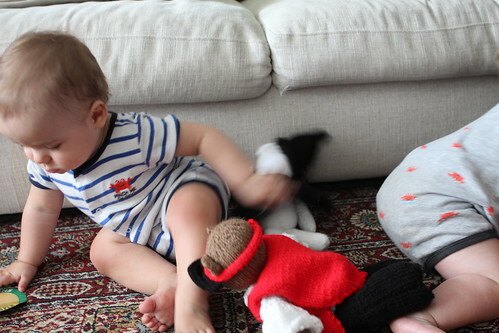 We attempted to take a picture of them posing with their dolls and these were the best two shots that we got. 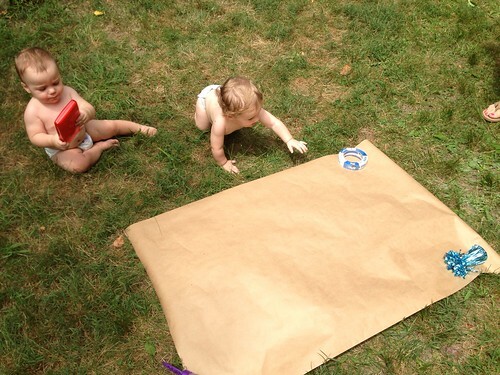 In the afternoon we took them out for another spin in their cars and Jen made some homemade paint for them to play with. 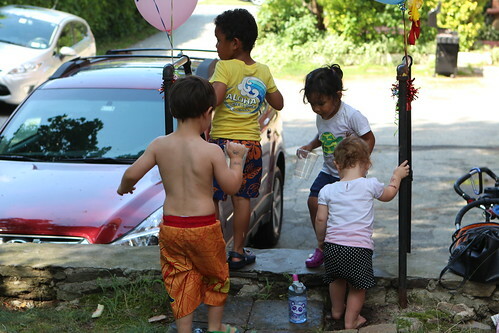 They also got sprayed down with the hose by their dad which was not their favorite part of the day. 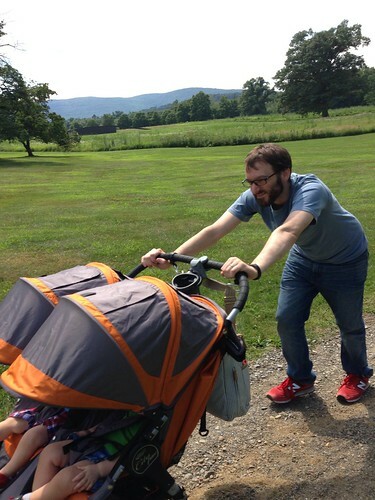 Also I strapped Martin into his car and accidentally pinched the buckle on Martin's belly. This was definitely the low point of the day for Martin but after a minute of rocking and hugging he had forgotten than anything even happened. 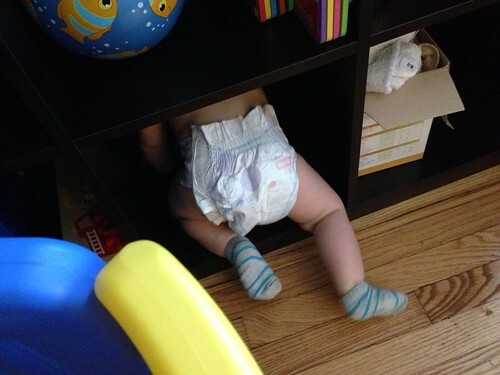 It will take much longer for his father to get over it. 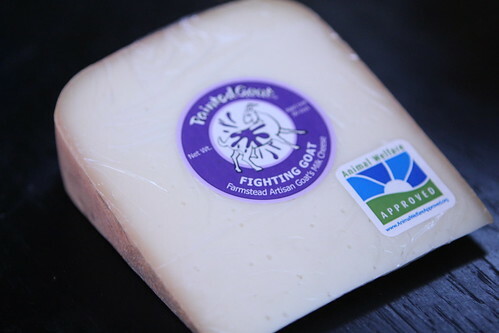 For dinner we enjoyed last week's goat cheese from the farm share this Fighting Goat! It was awesome as an accompaniment to another summer stew I made with garlic, onion, zucchini, tomato, and leftover grilled corn from the birthday barbecue. We also took the babies out to swing after their afternoon nap and stopped by the only place in town that is open past 4PM on a Sunday to pick up a loaf of bread. As it was near closing time they had two loaves to choose from and we paid the exorbitant price of seven dollars for a rustic loaf. The bread was good but I think I would have been more content thawing out some English muffins than paying that kind of money for a loaf of bread. 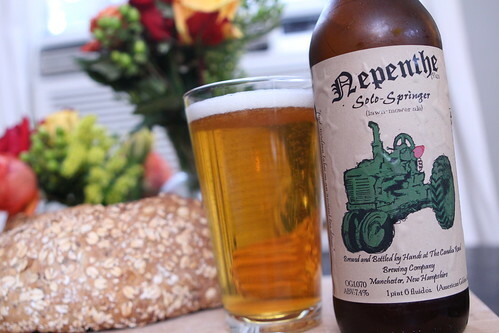 With dinner I had this Nepenthe Solo-Springer (lawn-mower-ale) from Candia Road Brewing Company, a gift from my Aunt Pat. It was really good, a fine conclusion to a busy weekend. 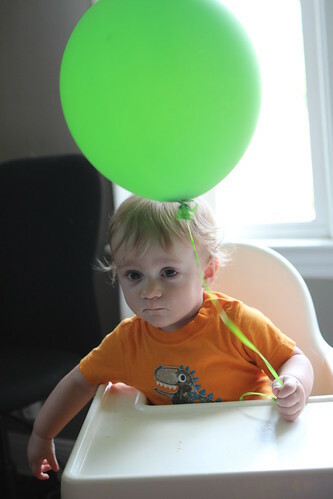 For dinner we tied some balloons around their high chairs for them to play with and made a FaceTime call to Jen's mother. She loved seeing the babies almost as much as she enjoyed warning us about the dangers of having a balloon near a child. She stated that babies can choke on balloons. 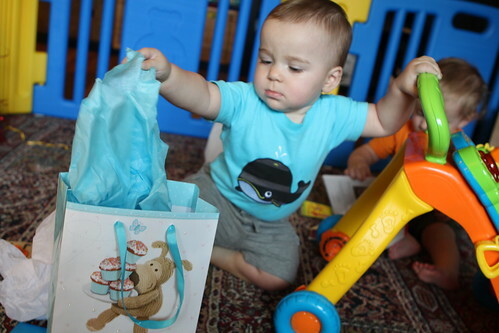 I completely agree that this is possible but wondered if this was such a cause for worry that babies should not be allowed to have balloons at their birthday party. 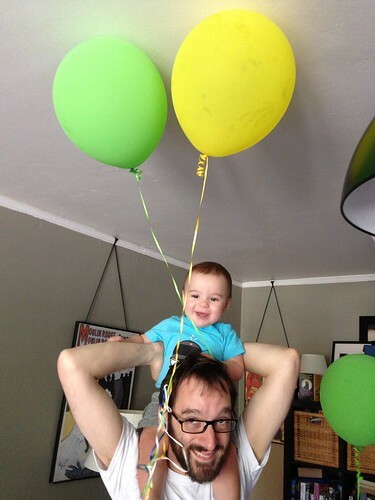 She said that I'd be surprised to find out how many babies choke on balloons. I asked her to send me the raw figures so that I could peruse them. Unfortunately the numbers were never sent for my consideration so I guess we'll never know. Except that I did my own private research to find out! According to a 2010 report on toy-related deaths and injuries filed in 2011 by the Division of Hazard Analysis at the U.S. Consumer Product Safety Commission there were, indeed, some children who choked on balloons. Is this terrible? Of course. Is it cause for balloons to be banned in the United States. Maybe not. My mother-in-law was right. According to the report there were 2 deaths in 2008. I was surprised by how many deaths there were -- I thought the number would be much higher than that. According to the 2010 census there are approximately 74,000,000 children between the age of 0-10 (the report doesn't break it down by that age range which is why this is an estimate). If that is true then that means there is was a 0.0000027% chance that the babies could have choked on those balloons last night. That's a 1 in 34,000,000 chance if you just go on raw odds. Since balloons are so clearly off limits now I did a little research to see what other activities and items that are way more dangerous than balloons. We wil will be eliminating the following activities from our lives immediately. The following odds are based on studies by UK scientists. Planes (1 in 11,000,000). That's three more times more dangerous than balloons! I guess we'll have to take the train to visit grandma and grandad from now on. Hot Tap Water (1 in 5,000,000 chance of death). It's been nice but we're moving to an all-cold tap water household. Snakes (1 in 3,5000,000 chance of death). While there aren't any poisonous snakes in this area there are still snakes and that's a chance I'm not willing to take. We'll be moving to northern Greenland. Trains (1 in 500,000). Okay, I think we'll have to drive to visit all our grandparents from now on. Drowning in Bath (1 in 685,000). We will bathe them again only once they have received their swimming certificates from the YMCA. Automobiles (1 in 8,000). We will just take a covered wagon to visit the grandparents. It will be just like playing Oregon Trail! Typhoid (1 in 2). So much for traveling anywhere. It's grim but I like to know what I'm facing. After looking at the raw data I am getting to work on constructing an inflatable rubber-padded bubble where we can all live happily together following a diet prescribed by Ray Kurzweil and watching television with sunglasses on. Martin says: "My parents don't love me. That's why they let me have this balloon. Please send help."